Available in light and dark wood gives you the best of both choices for the perfect match for your home. 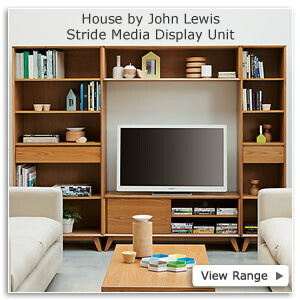 John Lewis TV Stands and furniture includes an extensive range of fully coordinating styles for every room in the house. When in comes to housing the latest tech and AV devices you will want a quality piece of furniture to set it off. 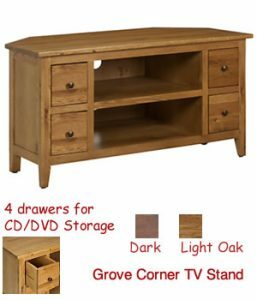 The Grove corner TV stand has plenty of storage room and looks pretty impressive too. 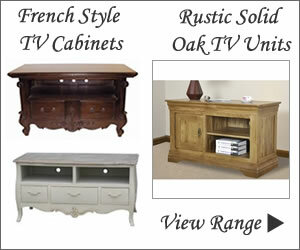 The country house styling and quality craftsmanship will make this a beautiful addition to your living room. 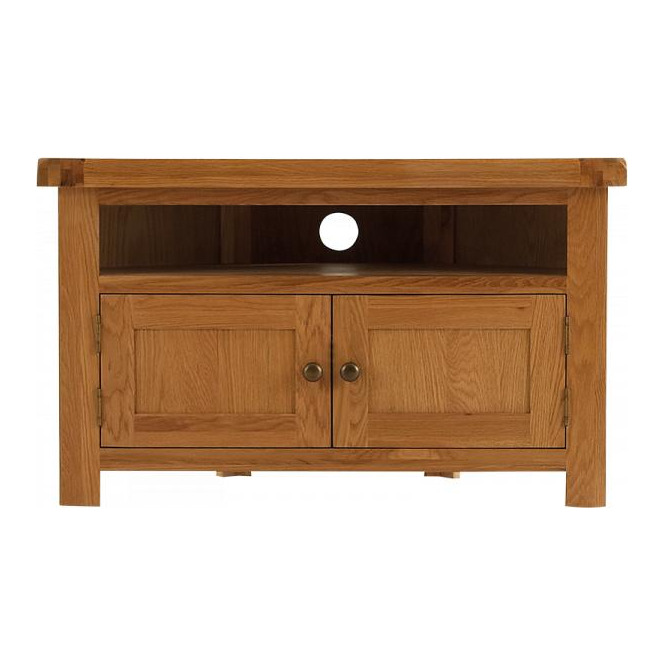 The light wood TV stand is crafted from American oak solids and veneers. 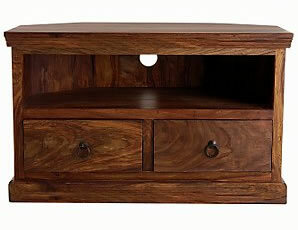 The dark wood TV stand is made from acacia solids and veneers with a dark finish. There is ample storage space with 4 drawers for CDs and DVDs with enough room for surround system, blu-ray player and sky box. 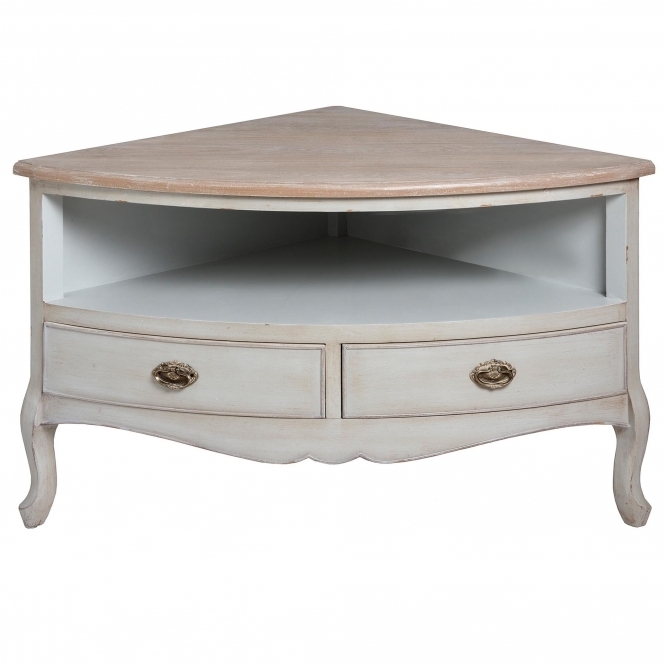 This well made attractive media unit is the perfect shape to fit into any nook to maximise room space. A corner unit with drawers also gives you the added bonus of extra storage that is neatly stored out of sight. Cables are also kept tidy too. The soft tones of oak blends with most decors and matches existing furniture without be too overpowering. These styles of light and dark wood entertainment cabinets makes a refreshing change from black and glass TV units. 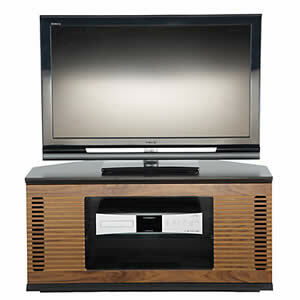 Get the best of both with this stylish space saving TV unit and sound system from Alphason. 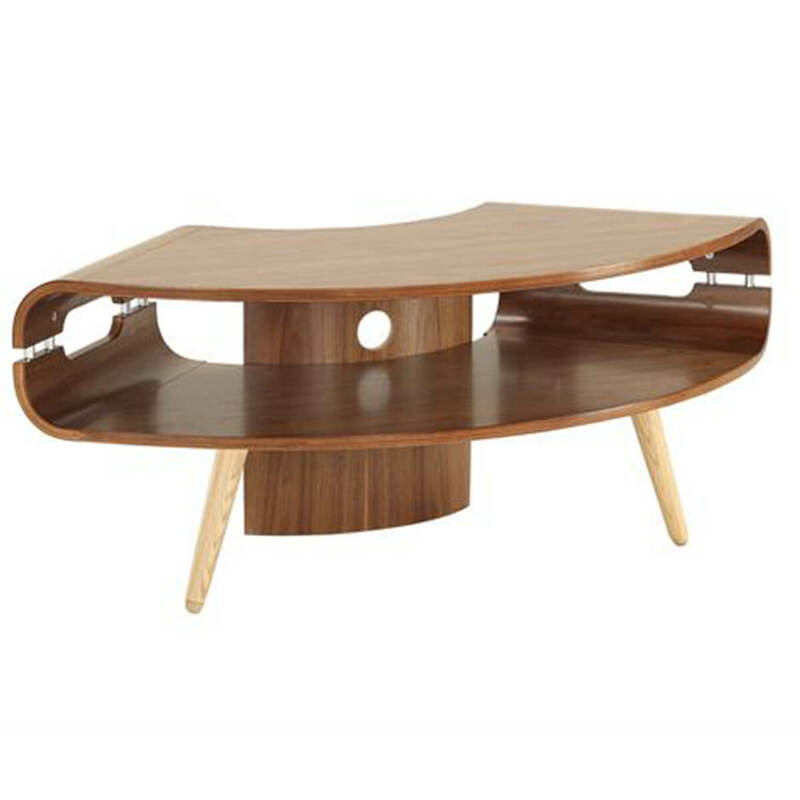 The ARN1000-W-RM dark wood television stand is finished in walnut veneer and features an integrated 2.1 channel sound system. It’s designed for flatscreen TVs up to 47 inch, has a glass front and safety glass shelf. 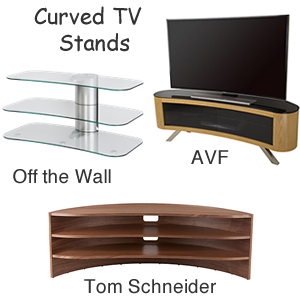 Enhance your home entertainment experience with a TV stand that fits in perfectly with today’s modern lifestyles. High tech TVs may produce cinema like images but the thinness of the screen doesn’t always deliver a sound to match. This clever two in one TV unit available from John Lewis not only looks good it does a superb job of filling the room with full stereo sound and real bass. It boasts 100 watts of amplifications from 8 speakers and an ultra-slim subwoofer. The enclosed TV cabinet with cable management keeps cables neatly tucked away and eliminates wire tangle. It is easy to use just connect up to the headphone output on your TV with the jack to jack cable supplied. Great sound can also be enjoyed from DVDs and CDs played on your DVD player. There are also inputs for playing music from your iPod or MP3 player through the speakers. 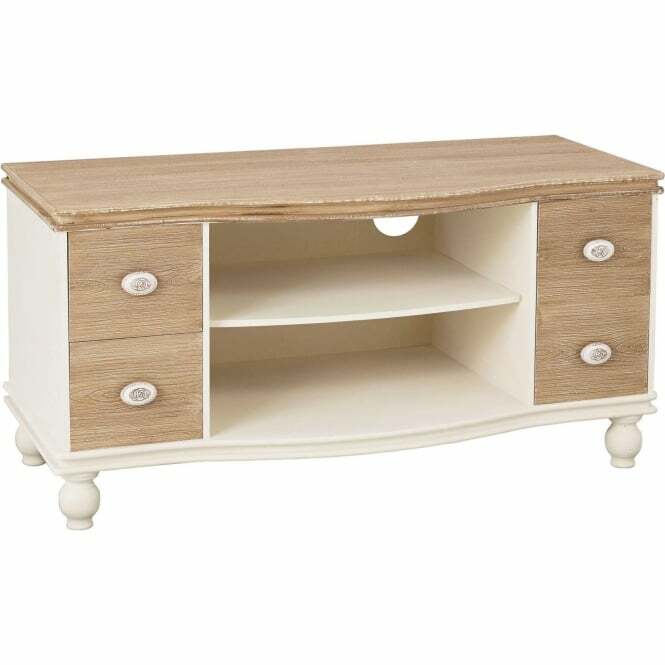 This attractive corner TV unit is part of John Lewis Maharani Furniture Range. Based on traditional Indian Thakat styling this striking collection is designed for today’s modern living. The handsome grain of the Sheesham wood complete with iron handles that look better with age adds to its overall appeal. A beautiful piece of furniture from John Lewis that combines a quality hand finished design along with good looks. To keep it in tip top condition polish with natural wax and wipe off any spillages straight away. The Maharani is a comprehensive range of dark wood living room and dining room furniture exclusive to John Lewis. Using the same type of wood throughout adds sense of continuity to the room. You’ll find plenty of matching items that will look good in the lounge. The Maharani DVD Rack is a must for storing a growing collection while the Maharani Drinks cabinet and side table is the perfect home for your favourite drink. 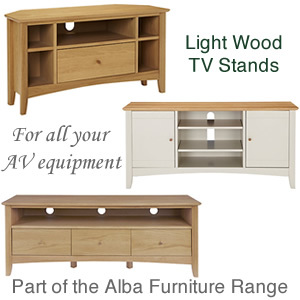 Buy a corner tv unit and save space and keep those cables out of sight. Room sizes vary and the style and layout of a room determines where the TV will be best suited. For the best TV viewing it is essential to find the optimal viewing position. That’s where a corner TV unit saves the day. Best of all there are so many types to choose from you’ll easily find one to suit the style that blends in with your home. The state of the art televisions in our homes really are impressive and make a wonderful centre piece in our living room. The newest LCD and Plasma screens are now incredibly light so they can be easily wall mounted but this doesn’t suit every home or particular room layout. 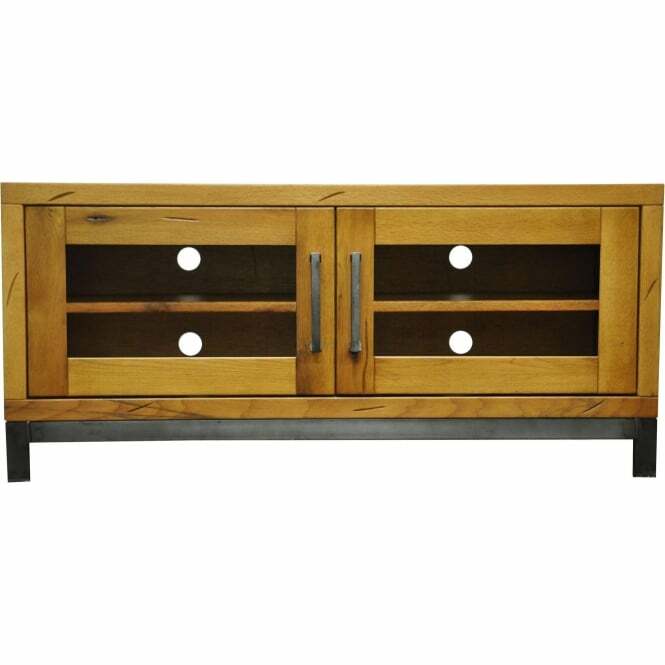 Let’s look at the choice available; there are solid wood TV cabinets in light and dark wood, oak and walnut effect, clear glass, and metal, black acrylic and painted wood. Less expensive storage units and stands can be readily bought that usually need assembling and at the other end of the scale are the top quality wooden range. Special designs are available to fit snugly in the corner of the room and can make quite a statement all on their own. They are streamlined to maximise space and can house DVDs, books, CDs etc in the side drawers and shelves. Wires can also be cleverly hidden away.